It is so annoying to have any of your files deleted on your phone most especially pictures. This has caused alot of thinking to some people because they do not know how to recover back their very precious pictures. This issues is very serious because we all been overzealous at some point deleting pictures and we've accidentally deleted the precious picture even we have accidentally deleted a whole album of vacation pictures or as a parent, any of your children somehow got his grubby little hands on your smartphone and wiped your camera roll cleaned up. Well, don't panic, in terms of technology....there is always a way to recover lost items. Just note that once you've deleted the pictures or other files, it is safe not to use your device until the data is recovered. When a picture is deleted, it is not deleted permanently, but rather it just opens up space for more data. The operation on your device then can generate new data and overwrite that space, which would make lost data unrecoverable. About iOS....Apple has really done a great job, mostly with your iOS 8, it is very easy to make photo-recovery with it. 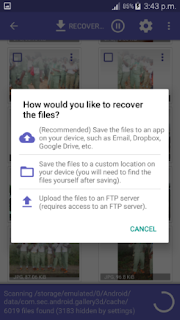 but when it comes to recovering deleted photos from Android phones and memory cards you'll need a little assistance from a third-party application but there are some newly released Android device that comes with recovery features like Gionee M6, when you delete a picture on that phone, it will be stored in a virtual memory space and after 7 days, it will then be permanently removed. The guide below will help bothe iPhone and Android user to recover their deleted pictures easily. Though their are different kinds of app on Play Store that will hell you recover your lost data but today, j will be showing you the best app to use which is called DiskDigger. 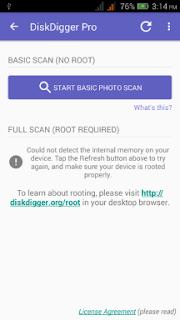 DiskDigger is an application that helps you in recovering deleted and lost pictures from your Android devices, it is very fast and easier to use. With this app, you don't need to root your device. It can undelete and recover lost pictures from your SD card and internal memory. After getimg your files, it is good to save/upload them in a save place such as Google Drive, Dropbox, or send them via email. The app also allows you to save the files to a different local folder on your device. DiskDigger has two versions, one is free and the other is premium version. The free one is just for recovering photos but the premium know as "DiskDigger Pro version " which costs N596.09 to get. With the DiskDigger pro version, you can recover other files and not just photos. Download DiskDigger Pro File Recovery here. So how can you set it up... After downloading and installing this app...follow the steps below.. Step 1. Open the DiskDigger app and tap n"Start Basic Photo Scan", the screen will be populated with a list of most recently deleted files. Step 2. When you see the photo you want to recover simply select it and hit "Recover..." button at the top. Step 3. The app will then ask you where you want to save the photo and after you pick its destination your photo should appear back in your memory card or phone system. Step 1. Get Access into your Photos App and go into your albums. Step 2. Scroll to the bottom and tap on "Recently Deleted." Step 3. In that photo folder, you will find all the photos you have deleted within the last 30 days. simply tap the photo you want and press "Recover." You can also press "Delete" to get rid of that photo permanently. But if there's a picture you were looking for that's older than 30 days, then you would have to either restore your phone using a saved backup on iTunes or used a third-party photo recovery app. That's all for iPhone, it's pretty simple.